The “Point of View” sculpture by James A. 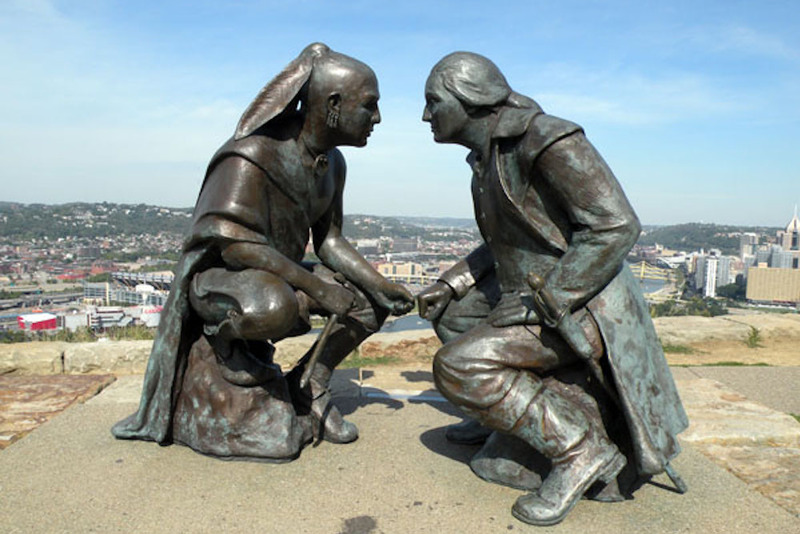 West in Pittsburgh, Pennsylvania, depicts George Washington and the Seneca leader Guyasuta. Courtesy of Wikimedia Commons. There are certain things about the nation’s founding era that many Americans don’t want to see messed with. The Declaration of Independence, despite its inaccurate claims that King George had already unleashed Indian warriors against the frontier, is an almost sacred text. And George Washington, despite the barrage of criticism he attracted during his second administration, sometimes seems immune from criticism. While I was working on a new book about Washington, someone asked me: “You’re not going to say anything negative about the General, are you?” As commander of the Continental Army during the Revolution, and as the first president of a nation that was not yet entirely sure it wanted to be, or could survive as, a nation, Washington united Americans, and Americans ever since have been united in their admiration. One legacy of the father of this country is often overlooked. At a time when the United States was still weak, many Indian nations were still strong and represented a significant threat to a precarious infant republic. Washington knew that he must build his nation on Indian land, and by war and diplomacy, he helped set the United States on a path of westward expansion that transformed tribal homelands into American territories and then into states. From our time and perspective, the outcome might seem inevitable; from his time and perspective, it was anything but. His dealings with Native Americans in securing the nation’s independence, survival, and future growth could be considered as another measure of his greatness. Unfortunately, those same dealings inevitably call that greatness into question. The primary goal of Washington’s Indian policy was to acquire Indian lands. In that, he succeeded. His second goal—and it was a distant second—was to establish just policies for dealings with Indian peoples. “The Government of the United States are determined that their Administration of Indian Affairs shall be directed entirely by the great principles of Justice and humanity,” Washington informed treaty commissioners heading off to deal with the Southern Indians in August 1789. Washington and his Secretary of War Henry Knox agreed that the most honorable and least expensive way to get Indian land was to purchase it in treaties. Offering Indian tribes a fair price for their land, Washington hoped, would allow the United States to expand with minimal bloodshed and at the same time treat Indian peoples with justice. The chief was right to be skeptical. A man who had swindled fellow officers out of the bounty lands they had been promised as payment for their services after the French and Indian War hardly could be expected to protect Indian rights against forces of expansion which he himself helped set in motion. Washington’s decisions set precedents that are still with us. As the father of the country, he was also the father of America’s tortuous, conflicted, and often hypocritical Indian policies. Yet Washington envisioned a place for Indian people in American society. He offered them the chance to remake themselves as Americans by extending them the benefits of American civilization—agriculture (to be practiced by Indian men, not, as had been the case for centuries, by Indian women), education, and Christianity. Some tribes seized the lifeline. The Cherokees rebuilt their tribe after years of war and land loss. Looking back from the 1820s and 1830s when Andrew Jackson was leading the charge to remove eastern Indian peoples west of the Mississippi, the Cherokee chief John Ross remembered with reverence the first president who had dealt justly with Indians. Ross even named his son George Washington. Washington’s decisions set precedents that are still with us. As the father of the country, he was also the father of America’s tortuous, conflicted, and often hypocritical Indian policies. While he aspired to a national Indian policy that might somehow reconcile taking Native land with respecting Native rights, he shared and shaped the attitudes and ambitions of his time, and employed deception and violence to attain his own and his nation’s ends. For example, the Treaty of New York, which he signed with a delegation of Creek chiefs in August 1790, contained secret articles to secure the agreement of chief Alexander McGillivray. And in 1791 Washington dispatched an army to defeat Indian resistance to American expansion by destroying Indian villages in northwest Ohio (a tactic that backfired when the Indians destroyed the army). In fall 2016, the museum at Mount Vernon opened an exhibit entitled “Lives Bound Together: Slavery at George Washington’s Mount Vernon.” The exhibit quietly, directly, and honestly shows that Washington’s home, wealth, and daily life rested on the unfree labor and exploitation of hundreds of African slaves. Even though he worried about slavery and freed his slaves in his will, Washington’s record and legacy on slavery are deeply ambivalent. So, too, are his record and legacy in Indian affairs. We can pretend that it wasn’t, or we can acknowledge it as we try to understand the first president and the nation he helped to build. 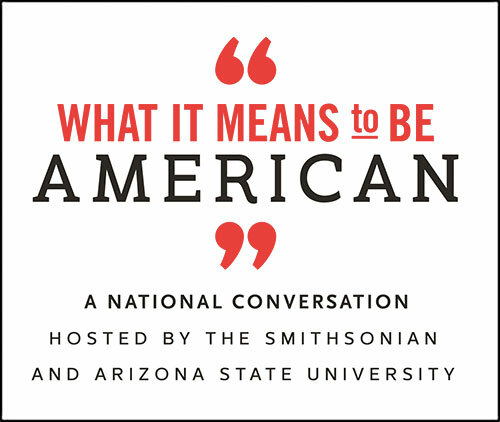 Colin G. Calloway is a professor at Dartmouth College and author of The Indian World of George Washington: The First President, the First Americans, and the Birth of the Nation.